What is your favourite childhood book? Why? I’d love to hear about your faves in the comment section! If you cannot pick just one, that’s okay, too. Just share your thoughts and experiences with reading. First, I’ll share mine, beginning with why I think Charlotte’s Web impacted me so much, and relate a favourite childhood memory of mine. I’ll then give you some background on both the plot summary and the author, too, as well as a few links to the book, the movies made, and some games and activities you (and the children you know) can play. 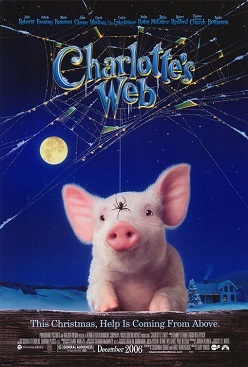 Basically, Charlotte’s Web is a touching story about the friendship between Wilbur the pig and a spider named Charlotte, who saves Wilbur from slaughter by using her ingenuity to weave words in her web to capture the attention of the farmers and show the world what a wonderful pig Wilbur is. Watching the movie evoked memories of buying books at school via an order-form. Once a month in elementary school, my classmates and I would receive some type of flyer from a book publisher that listed the different books we could buy. I looked forward to those days, and would rush home from school to show my mother the books that I wanted, having selected several both during class and on the bus ride home. I always looked at the prices, too, as I knew my parents didn’t have a lot of money to spend, and so formed different proposals in my head, angling to get the two books I wanted the most (though I usually wanted four or five). Fortunately, my mom couldn’t resist my excitement or the pleading I did, and often gave in to my desires, only bargaining with me when my brother and sister, who attended the same school, wanted multiple books, too. As a former grade-school teacher and the woman who encouraged me to read and write at such a young age (she taught me to do both, including how to write cursive before I turned 6), I loved it when she granted me permission to fill out the order form myself! After I totalled my order, she’d double-check to see that my siblings’ orders and the total were correct. She’d give me funds in the exact amount of the order, and I’d return to the school the next day (usually, unless she didn’t have the cash on hand) with money enclosed in a special sealed envelope. While I waited for the new shipment of books to arrive, I read the books that I had previously ordered. It didn’t take me long, though. So I used the library in the meantime. It was hard waiting for the books I ordered, but when they came in the following month, along with a new order form, what an exciting day that was! Delivery day! I can still remember sitting on the edge of my seat as the boxes that were brought to my classroom were unpacked. As books were unloaded, names were called. I anxiously awaited my turn. When I had my specially-ordered books in my hands, it felt like Christmas time did! I was thrilled! I have to admit: I sure miss those days! I still have my copy of that book, somewhere, believe it or not. My mom also used to order books for us from Grolier, and they would be delivered monthly, too. Charlotte’s Web is an excellent book for children! After sparing the life of a baby piglet almost slaughtered due to his status as runt of the litter, a little girl named Fern Arable adopts it and nurtures it lovingly, naming it Wilbur. However, she is crushed when the piglet matures enough to be separated from his mother, and Wilbur is thus sent to reside on a farm owned by Fern’s uncle, Homer Zuckerman. Her powerful attachment to Wilbur mutual, the pig is left yearning for companionship but is snubbed by other barn animals. However, he is welcomed by an unseen voice who promises to befriend him, vowing to reveal itself to him in the morning. The voice is revealed to belong to a spider named Charlotte living on a web spun overlooking Wilbur’s enclosure. Knowing of Wilbur’s impending doom (as the Zuckermans plan on slaughtering him) she promises to hatch a plan guaranteed to spare his life. Sure enough, the following morning the Zuckermans are flabbergasted to catch sight of the words “SOME PIG” woven into the spiderweb, attracting great recognition and publicity. Understanding that Wilbur’s chances of survival will be strengthened if similar miracles were to occur, Charlotte employs the assistance of Templeton the barnyard rat in gathering labels as inspiration for her spiderweb messages. As time passes, more and more engravings continue to appear on Charlotte’s webs concerning Wilbur’s value, attracting increasing notoriety and publicity. Soon Wilbur is entered in the county fair, accompanied by Charlotte and the gluttonous Templeton, aware of the discarded foods littered along the fair grounds, and, while there, Charlotte spins an egg sac containing her unborn offspring—which she refers to as her “magnum opus”—that is heavily guarded by Wilbur. However, the pig is crestfallen when the spider notifies him of her impending death and mentions that she is to pass away before long, staying behind at the fair and dying after Wilbur’s departure. Heartbroken, Wilbur guards Charlotte’s egg sac, and is saddened further when the new spiders hatch and depart shortly after their birth, leaving behind three spiderlings too young to leave just yet. Pleased at the thought of finding new friends after Charlotte’s demise, Wilbur names the spiderlings Joy, Nellie, and Aranea, and the book concludes mentioning that more and more generations of spiders continued to arrive with time to keep Wilbur—who is now safe from death—company. Did you read this classic book when you were a child? Charlotte’s Web, written by famed American E. B. White (July 11, 1899 – October 1, 1985), was published in 1952, a few years after he wrote Stuart Little. To this day Charlotte’s Web remains one of the top 100 books for children. But what most people don’t realize is that, in real life, the author, Elwyn Brooks (“E. B.”) White had tried to save a pig, and failed. Clearly, E. B. White was more than an author. He had a kind heart! He also became a famed individual who accomplished much in the literary world. He was a contributor to The New Yorker at a time when it was arguably the most important American literary magazine, and was a co-author of the English language style guide, The Elements of Style, which is commonly known as “Strunk & White.” He won many literary awards and honours, too, for his substantial and lasting contributions to children’s literature, including the Pulitzer Prize, in 1978, a prestigious award coveted by writers from all walks of life. He was a quiet man who disliked publicity. He served in the army before going to college, where he obtained a Bachelor of Arts degree in 1921. He married in 1929, lived a long life, and died at the age of 86 from Alzheimer’s disease. There have actually been 3 movies made, to date. Charlotte’s Web: Did you see the movie or read the book? As adults, we often forget what fun it is to be a child. We spend time on Facebook or StumbleUpon to find things to lift our spirits and offer us an escape from the reality and stress of our lives. Remember Hangman? Tic Tac Toe? Hopscotch? Double-dutch skipping? Tag? While I cannot direct you to places to engage in all of these activities, I can invite you to play Hangman using characters and words from Charlotte’s Web! If you have young children (ages 4 – 7), a video game is available, too. Charlotte’s Web is being sold on Amazon and on Barnes & Noble. I’m sure other places sell it, although I think the price is similar all over. While you’re shopping, you might want to pick up a copy of my book, Risky Issues, as well, as this book deals with issues of identity, friendship and death, too. You can get it from Amazon or Google Play/Google Books, and learn more about it here. Other Childhood Books + Your Turn to Speak! So now that you know what my favourite childhood book was, it’s time to reciprocate. What is your favourite childhood book? Why? Share your book titles in the comments! And feel free to speak to one another, too, especially if you share the same book-love! Our teacher read this book to us in the third grade. It was one of my earliest memories of learning about death through a book. I saw the film also that came out about ten years ago. Sarah McLachlan wrote “Ordinary Miracle” for the film and I love that song. Simply beautiful. I loved ordering books from the order form. I still remember the feel and the smell of the newsprint that the catalog was made of. I didn’t really have a favourite book as a kid. I do think I would like to take a children’s literature course one day. Death is hard for children to accept. Can you think of any other classical books that deal with this subject? 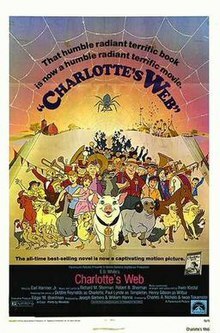 I remember Charlotte’s Web and I had the movie too! My fave was Alice in Wonderland 🙂 By the way, I really like the updated look of your site here, my friend! Very pleasing to look at! I loved Alice in Wonderland, too! My grandmother gave me a children’s anthology when I was in the 4th grade. It was the first book that was my very own (I have five siblings and we shared most books). I read those stories and poems over and over, and there were a lot. The book was nearly 4 inches thick. It is now out of print, and right at this moment I cannot remember the name of the book. I passed it on to one of my children when his children were little. Michelle, it is great that you passed that book on! I remember my mom had bought my siblings and I a collection of five or six books that were all related to the Walt Disney stories. They were huge, and illustrated, too. I would re-read them year when I was a child. Lorraine, your post brought back memories of searching through that mail-order pamphlet. I think that is the first time as a child I looked at what something cost in relationship to what it was worth. I still agonize over the cost of a book vs. my desire to read it while in a book store. Thanks for the post. Kire, I appreciate your comment. I’m glad I was able to remind you of that mail-order pamphlet. I sure loved that piece of newsprint! Do you read many books now? What about e-books? Jacqueline, I’m glad this post evoked some of your good memories. I never really thought about the idea of renewal when I was a child, but I sure know about it now! Spring is my favourite season, for that very reason. I remember we made a play from Charlotte’s Web and yes, I love Alice in Wonderland too even the Tim Burton movie version. I like to re-read children’s books and see how my feelings have changed. Have you re-read any books you read as a teen? Alice, I’ve never seen a play of Charlotte’s Web. That must have been one heck of a play! Very cool that you were a part of that! Way back, when I was in third grade I got glasses. Up to that point, it turned out, that I was seeing 12 times larger than the real print size. Glasses made the print SO small that I had a very difficult time reading for quite a while. My grade school was across the street from the library, so that was where we would get our books. When our daughter was in school, she LOVED those book orders. Even as a young girl she LOVED to read, and actually could speed-read and remember each book then for years. She also loved the library bus that came around as she got into the upper grade school years. I think it came about once a week, and she would get 20 books at a time. She would read all of them, and be WAITING for the bus to come again! As an adult, she still LOVES to read. Barbara, what a weird experience that must have been for you, seeing things 12 times larger than they really were! I’m glad you were able to correct it with glasses, even though you went through a period of adjustment.